Along with dicing and machining, Hausser Scientific offers conventional glass cutting as a fast and economical choice for your glass parts. Our wide array of glass cutting equipment includes auto-cutters, strip cutters, odd shape cutters, and disc or circle cutters. We can cut any size, shape, or thickness that you may need. Years of experience in all phases of glass cutting and a large in house glass inventory means that we can get your job done faster. 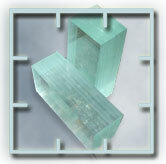 We offer score/snap cut and diamond saw cut glass along with edge finishing. 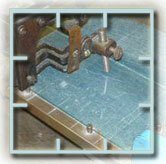 Score/Snap cut is done with a diamond stylus or carbide wheel. Very Economical, Very Fast, Very Clean process. No blocking or wax involved. We can cut straights, circles, radii, or any custom odd shapes. Perfect for one-of-a-kind or smaller quantities, when precision is not as critical. Edge finishing can be a simple swipe to remove sharp edges or beveling to a specific profile that you may require. We also offer glass washing services for your more critical parts. Whether you need one piece or millions, Hausser Scientific can meet your needs quickly, precisely, and with the reliability you need. Call Hausser Scientific for a quick and competitive quote.